I received this cookbook for Christmas and decided to try a soup recipe on this cold, snowy day (plus I also got a new immersion blender for Christmas that I wanted to try!). This soup is really all about the flavor of the carrot. You can certainly change up the herbs and spices to your liking or use stock instead of water, but I'd give it a try as is first. The recipe makes about 8 cups of soup. In a large stock/soup pot, melt butter and add some olive oil over medium heat. Add the onion and leek and cook for about 5 minutes, stirring occasionally. Add the carrot and salt, stir, and cook for about 10 minutes. Add the herbs, pepper, and water and bring to a boil. Reduce heat and simmer for about 25 to 30 minutes. Remove the soup from heat and remove the bay leaf. Puree in batches in a blender or with an immersion blender until smooth. Return soup to the pot. Add the zest and orange juice (and milk/cream, if using). Warn over low heat. When hot, top with garnish and serve. Overall I enjoyed this soup. I think it would be really great with some fresh ginger and a bit more orange, which I may try next time. This is a really simple dip to make for any sort of gathering. I often make it at Christmas time because of its festive coloration, but it's great whenever you need a tasty, easy snack. People often ask for the recipe when I bring it somewhere. I found the recipe for this dip in a Gooseberry Patch (Christmas Book 8 - Sweet red pepper dip) book that my Grandmother gave to me. I changed it slightly. Place all ingredients except the chives in a food processor and pulse until smooth. Place the mixture in a bowl and stir in the tablespoon of chives. Refrigerate for at least one hour (up to overnight) and top with a sprinkling of paprika and reserved chives before serving. 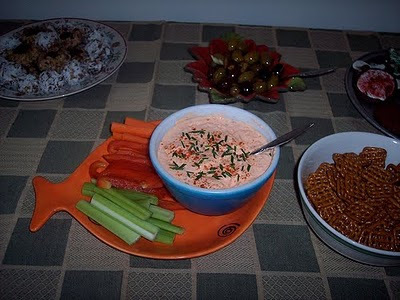 The dip is great with any fresh vegetables as well as pretzels, pita chips, etc. This is the last Christmas cookie I will write about for this season. I found this recipe in the December 2009 issue of Martha Stewart Living magazine. These cookies turned out pretty good, though not my favorite cranberry and cornmeal based Christmas cookie I've ever had. I changed the recipe only slightly. The below recipe is what I used. One of the main things is that I substituted clementines for oranges and clementine juice for water in the cranberry mixture -- because we have tons of clementines (I used a lot more zest, too)! This recipe will make about 2 dozen almost bite-sized cookies. The texture is a bit crunchy and the cranberries are a bit tangy. Preheat oven to 350 degrees. To make the cookies, first whisk together the flour, cornmeal, and salt in a medium bowl. Beat butter and 1/4 cup of sugar in a large bowl until pale and fluffy. Add the zest and egg yolk and mix well. Slowly add the flour mixture and mix until just combined. Lightly whisk the egg white in a small bowl. Scoop about a teaspoon of dough and roll into a ball. Dip the top part only into the egg and the remaining sugar. Place onto a baking sheet lined with parchment paper. Repeat with remaining dough placing cookies about one inch apart. Gently press the center of each cookie with your thumb. Bake the cookies until a pale golden color, about 15 minutes. After removing from the oven, use the handle of a wooden spoon to gently indent the center of the cookie. To make the filling, combine all ingredients in a small saucepan and cook over medium heat until it boils and the cranberries begin to pop. Reduce the heat to a simmer and gently mash the cranberry mixture, cooking about another 5 minutes. Add more juice or a bit of water if too thick. Let cool completely. Then refrigerate and add to the center of the cookies before serving. I made these cookies last Christmas as my cut-out cookie and they were a big hit. So, I decided to add them to my Christmas cookies again this year. I love ginger and so does my husband. I just discovered crystallized ginger last year. You should be able to find it at larger grocery stores, especially around the holidays. These cookies are a bit spicy and get even spicier after they sit for a day or two. This recipe will make between 3 to 4 dozen cookies depending on the size of your cookies/cookie cutters. I used a slight variation of this recipe. For the icing: I use a mixture of icing sugar and the juice of the citrus fruit I zested above. I just mix them until they become the proper consistency. The icing is optional, of course, but I think this sweet icing and some decorating sugar are a nice compliment to the spicy cookie. In a large bowl, whisk together first 9 ingredients and set aside. Place crystallized ginger in a food processor with a metal blade. Pulse to coarsely chop. Add brown sugar and citrus zest, and process until ginger is finely chopped and incorporated into the sugar. Combine butter and sugar-ginger mixture in a large bowl; cream together with a mixer until light and fluffy. Add molasses and egg; beat to combine. Slowly add dry ingredients, and mix to combine. Divide dough into 2 equal portions and place on large sheets of plastic wrap. Flatten into disks about one inch thick and wrap tightly. Refrigerate for at least 2 hours. Preheat oven to 350 degrees. Line baking sheets with parchment paper. Roll out dough on a well-floured surface to 1/4 inch thickness (keep remaining dough refrigerated until ready to use). Cut into shapes using cookie cutters. Re-roll and cut as necessary. Place one inch apart on baking sheets. Bake for 7 to 9 minutes. Cool on a wire rack. Once the cookies are completely cooled, decorate with icing and sugar/sprinkles. Let dry completely and store in an air tight container. These rosemary shortbread cookies have become a holiday staple in our household. They make an appearance on our cookie platter pretty much every year. I love that they contain rosemary, a holiday time scent. As a bonus though, rosemary looks like pine needles and the smell sort of reminds me of pine, which is why I turned them into cut-out cookies shaped like Christmas trees rather then slice and bake shortbread. I think they are a unique cookie and something different to try for your holiday cookies. They are a nice change from all the super sweet cookies and smell really good, too. The rosemary flavor improves and becomes stronger after a couple of days. They are a simple cookie in flavors, but add a nice touch to our cookie tray. This recipe will make approximately 2-1/2 dozen cookies. The dough is fragile, so be careful when transferring these cookies to and from the baking sheets and cooling racks. In a medium bowl, cream together the butter and sugar until light and fluffy. Stir in the flour, salt and rosemary until well blended. The dough will be somewhat soft and crumbly. Bring the dough together into a ball and pat into a disc. Wrap in plastic wrap and refrigerate for at least 1 hour. Preheat the oven to 350 degrees. Line two cookie sheets with parchment paper. On a lightly floured surface, roll the dough out to 1/4 inch thickness (the dough may be difficult to roll until it sits out for a few minutes - I like to do half at a time). Cut into trees using a cookie cutter (or any shape you choose). Place cookies 1 inch apart on the lined cookie sheets. Sprinkle the tops of the cookies with the decorating sugar, if using. Bake for about 6-9 minutes until just golden on the edges. Carefully remove using a spatula because the cookies are fragile. Cool on a wire rack and then store in an airtight container. This soup is a great way to use pie or sugar pumpkins, or the excess pumpkin puree you bought during the fall when it was on sale. It's a good combination of sweet and spicy. You can either roast a fresh pumpkin or use puree (just make sure to get plain pumpkin and NOT pie filling!). I absolutely love cooking with pumpkin and all winter squash once they are in season. Give this fall treat a try. It will make enough for about 4 servings. If using a fresh pumpkin, cut it into quarters, removing all of the seeds and strings. Drizzle with olive oil and some salt and pepper. Roast in the oven at 375 degrees for approximately 30 minutes or until tender. Let cool and then scrape the flesh away from the skin and puree in a food processor. If using canned pumpkin... skip that step. In a large soup pot saute the onions and jalapenos in olive oil until soft and the onion is translucent. Add all remaining ingredients to the pot except for the cream (and cilantro). Warm the mixture and then slowly add the cream. Heat until warmed (do not boil). For a smoother soup, you can run the onions and jalapenos though a food processor with a bit of the stock or use an immersion blender. Serve hot and top with cilantro. 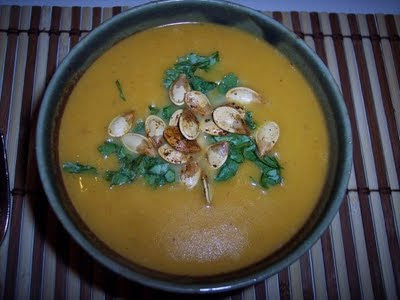 You may also top with roasted pumpkin seeds if you used a fresh pumpkin, as shown in the photo. I think the pie turned out really well...especially because it's only about the 5th time in my life I've ever made a pie, the 3rd time I've ever made a pecan pie, and the 1st time I ever made my own crust. 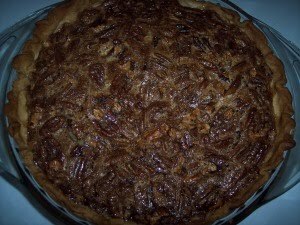 I made a pecan pie because we had brought home a sack of them from Georgia and because it's my mom's favorite pie. I recruited my husband to shell the pecan while he was watching hockey! I wanted to try an olive oil crust because they are slightly healthier and thought it would be a good first pie crust attempt. Add flour and salt to a mixing bowl. Whisk together and then add the wet ingredients. Mix until just combined and then use your hands to mold it into a ball shape. Do not over-mix or "play with it" as it will become tough. Roll out the dough in between two pieces of wax paper until about 1/4 inch thick. Place in a 9-inch pie pan and fit it to the pan, crimping the sides and using any excess to fill tears or thin spots. In a large bowl beat the eggs with a whisk. Then beat in both sugars. Stir in the corn syrup, salt, vanilla, butter, and pecans until combined. Pour into an unbaked pie crust in a pie pan. Bake for about 10-15 minutes at 400 degrees, then reduce heat to 350 degrees and bake for another 30 minutes or until golden brown. The filling will puff slightly. If the crust begins to turn too dark, cover it with aluminum foil and continue baking. Let cool to help set the filling. Serve plain or topped with fresh whipped cream or vanilla ice cream and a sprinkle of cinnamon. I made this after we ended up with a TON of apples after over-picking them this fall (which always happens). The combination of apples, onion, and fennel roasted in the oven is delicious and just screams fall to me. Fennel is one of my more recent discoveries and I must say that I will not look back! I really enjoy the anise taste, plus it is good for your digestion. The tangy apples and sweet onions pair really well with the fennel and it all comes together with a delicious apple cider and mustard based sauce. This is a really tasty dinner, full of fall flavor - perfect for an evening after apple picking. On a large plate, spread the lemon zest, garlic powder, black pepper, and some salt. Rub the pork loin in the spice mix until well-covered. In a large, oven-safe skillet heat some extra virgin olive oil. When hot, put in the pork browning on all sides. After it is browned, place the skillet in the oven. Spray an oven safe baking dish or baking sheet with olive oil or non-stick cooking spray. Remove the core from the apple and fennel. Slice the apple, fennel, and onion into similar-sized pieces and put in the baking dish. Toss with olive oil, lemon juice, fennel seeds, thyme, and salt and pepper to taste. Place in oven. Cook until the apple mixture has browned and softened. Cook pork until about 145-155 degrees. Remove from oven and let rest on a plate. Drain excess fat from the skillet and over low heat add stock and cider to the pan. Scrape all the brown bits from the pan and mix in mustard and honey. Place apple mixture on a plate. Top with some slices of pork. Top that with some of the sauce and chopped fennel fronds. I decided to bake my Grandmother a birthday treat. I've not really baked much before, but it’s starting to grow on me. 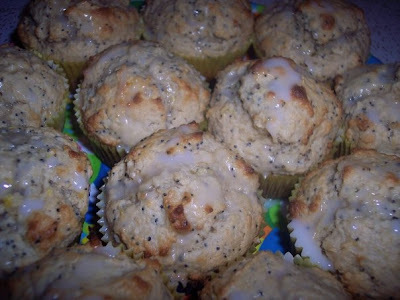 I decided on lemon poppy seed muffins. I looked at a few recipes before deciding on how to make them. This is what I came up with and they turned out really well. These muffins have provided me the encouragement to continue exploring the fun of baking! Pre-heat over to 400 degrees. Prepare a muffin pan by spraying with a non-stick spray or putting paper muffin cups in the 12 muffin molds. In a large bowl whisk together the lemon zest, sugar, flour, baking soda, baking powder, and salt. In a separate bowl, whisk together sour cream, eggs, butter, juice of one lemon, and vanilla. Slowly add the wet ingredients to the dry while whisking together until blended. Add poppy seeds and stir. Evenly distribute the batter among the 12 muffin molds. Bake for 15-20 minutes, until the tops turn a light, golden brown. Remove from the oven and cool. Place the powdered sugar in a small bowl and whisk in lemon juice until it forms a glaze. Drizzle over the muffins and let dry. I started a food blog this past summer on a different site and have decided that I'm going to give this one a try instead... I'm going to be moving over some of my posts from that blog as I get this one started. I made these sandwiches for my husband-to-be (at the time - now he's my husband) for his birthday back in August. I asked him to pick ANYTHING that he wanted for his birthday dinner and out of the infinite possibilities, he chose this sandwich. 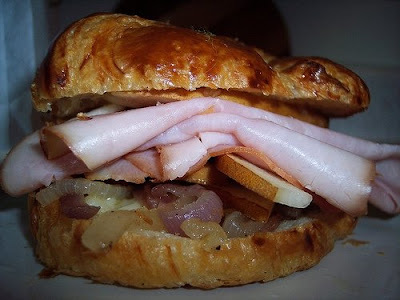 This sandwich is one I made after having something fairly similar when we were in Lancaster, Pennsylvania and it’s been one of his (and, admittedly, my) favorites even since. I just made these sandwiches again this past weekend as part of a birthday dinner for my mom, too. So, I've now deemed them "birthday sandwiches". The only real cooking involved here is caramelizing the onions. Remove the skin from the onion and slice it thinly. Heat about a tablespoon of butter with a splash of extra virgin olive oil in a skillet over low-medium heat. When warm, add the onions. To caramelize properly, you must cook the onions low and slow until they turn a golden brown and sweet. Stir them occasionally and add a dash of sea salt and freshly ground black pepper about halfway through the cooking process. While the onions caramelize, you can assemble the rest of the sandwich. Slice the croissants in half and place a few pieces of brie on each side. I like to warm them up on a toaster oven to melt the brie a bit, but that’s optional. Slice the pear thinly (I leave on the skin for texture and color – make sure to remove any core and seeds). Once the onions are fully caramelized, add the ham, onions, and pears to your croissants in any order. Eat and enjoy!